As the third decade in the reign of Queen Victoria neared its end, the ancient art of angling stood on the brink of its evolution into the modern pastime we know today. Yet this simply couldn’t have happened without the insight of a great many Victorian anglers, but for whose dedication the Georgian idea that angling was merely a recreation for the rich and the privileged might well have endured into the early years of the 20th century. In the mid-19th century, the fishing on most of the rivers and streams in the north of England still fell under the jurisdiction of the many landowners claiming riparian rights, the traditional ‘landed gentry’ who, even by the 1860s, were fast becoming a relic of the pre-industrial age. Those who could afford to – and could also be bothered – would hire river watchers and gamekeepers to regulate the fishing and to make sure the uninvited did not visit to their waters with crude and often environmentally damaging techniques for the poaching of their fish stocks. Yet this was a time of near continuous migration, with new industry driving a relentless, century-long exodus from the countryside into the towns. These new townies may well have dwelled in the back-to-back terraced rows that sprawled across the landscape, but they did not easily forsake their wily country traditions. With terrible poverty characterising the Victorian working classes, the fish stocks in nearby rivers amounted to an easy food source for those willing to take their chance. On rivers running through those country estates without the will, or the wherewithal, to employ river watchers, the toll on the local trout population could be heavy, and by the second half of the Victorian era, these practices, combined with the exponential growth in the nation’s populace, were inflicting great damage on the ecological wellbeing of rivers and streams. Of equal threat to the fish stocks, at least on those rivers to which this new population was neighbour, was the serious issue of pollution. Until such time as acts of Parliament introduced proper regulations in the late 19th century, the factories and mines where the workers toiled would discharge their lethal effluents directly into the rivers and their tributaries, with dire consequences for fish and the invertebrate species upon which they depended for food. With the arrival of modern sewerage systems in the new towns as they grew, untreated sewage too became a serious threat to aquatic life. Nowhere more so were these combined threats experienced than on the River Derwent, a small tributary of the River Tyne, which, since the Middle Ages, had formed the border between Northumberland and County Durham. That an Association be formed for the Protection of Fish in the River Derwent and its Tributaries and that such Association be called ‘The Derwent Angling Association’. That the Association be governed by a President and a Committee of not less than six members, to be elected annually, together with a Secretary and a Treasurer, who shall be ex-officio members of the Committee”. 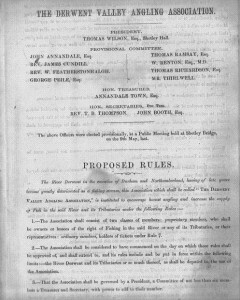 The report concluded that “such a Committee be authorised to communicate with the Landed Proprietors along the Banks of the River, asking their cooperation in furthering the objects of the Association, and report the result at a future Meeting, together with the Proposed Rules and Regulations for the working of the Association.” A Subscription List was opened with all monies raised to go towards the funds of the new Association. The first subscription list contained 15 names and raised £32, 12s and in August of that year, Honorary Secretaries the Rev. FB Thompson and John Booth Esq., two of the principal benefactors, wrote a further communication to the Consett Guardian. “Public attention has recently been called to the state of the River Derwent and to the injury which of late years has been done to angling: Firstly by pollution of its waters, and Secondly, by poaching which is carried on to a great extent by netting and liming the river and its tributaries. With this sentiment at the forefront of their proposal, Messrs Thompson and Booth continued that it was of great significance that two members of the Annandale family had seen fit to join the Provisional Committee of the Association, with three members of this influential family in total having been subscribers on the initial list. The Annandales, proprietors of a large paper mill in nearby Shotley Bridge, had reportedly “pledged themselves to do everything to promote the objects of the Association that is within their power of neutralising the noxious substances which enter the river from their manufactories”. The Honorary Secretaries further reported to having already received promises from several landowners for the transfer of fishing rights to the Association on its formation, and that the Committee were confident that “this privilege will generally be accorded to the Association by owners of the land through which the River and its Tributaries flow”. Over the page, beneath a list of the members of the Provisional Committee, were the proposed rules of the new association. There were to be two classes of member: proprietary – the owners or lessees of the rights of fishing on the river, and ordinary – holders of annual tickets issued by the Association in return for a 10 shilling subscription. An elected committee was assigned to administer the organisation and, in an age when regional and even local byelaws related to more serious matters, this body empowered upon itself the right to make the rules which would govern all fishing on the Derwent in years to come. These included, in brief: that the season for trout fishing should start on 16 March and end on 31 October in each year, that fishing between the end of first hour after sunset and the commencement of the last hour before sunrise be prohibited and that the use of night lines be strictly forbidden. The size limit for takeable fish was determined at five inches from nose to tail but no restrictions were proposed regarding the number of trout any one angler could kill. A further public meeting was held on 30 October 1865 to ratify the rules and constitution. Thomas Wilson of Shotley Hall was duly elected President of the Association, to be ably assisted by a committee comprising Messrs Annandale Town, George Peile, Thomas Richardson, W Renton, Thomas Ramsay, James Annandale, John Annandale, Thirlwell and Charlton, along with the Revs Featherstone and Cundill. The Rev Thompson and John Booth retained their positions as Honorary Secretaries and it was further stated that enough promises of support had been made to warrant a commencement to the Association’s tenure on the river the following year. A penalty of Five Pounds was set for anyone caught fishing during the night, with a £2 fine for poachers operating in daylight, and a reward of Two Pounds was offered to “any Person who shall give such information as shall lead to the Conviction of Persons Liming or Poisoning the Waters deputed to the Association, or Netting or Taking Fish therein by any other illegal means.” Legal anglers could obtain their season tickets, the notice concluded, by application to Rev FB Thompson, The Parsonage, Benfieldside. The first season of fishing under the auspices of the Derwent Angling Association was thus in 1866 and although a public meeting was held in late October of that year, the Annual General Meeting to discuss its outcome was delayed until 1 April 1867. The AGM reported that great progress had been made in regard to the amount of water now leased to the Association, with, in addition to those enrolled the year before, a further 11 proprietors having consented to allow members to fish from their land. With other deputations expected to follow, it was hoped that soon the whole of the river would be fishable by members. 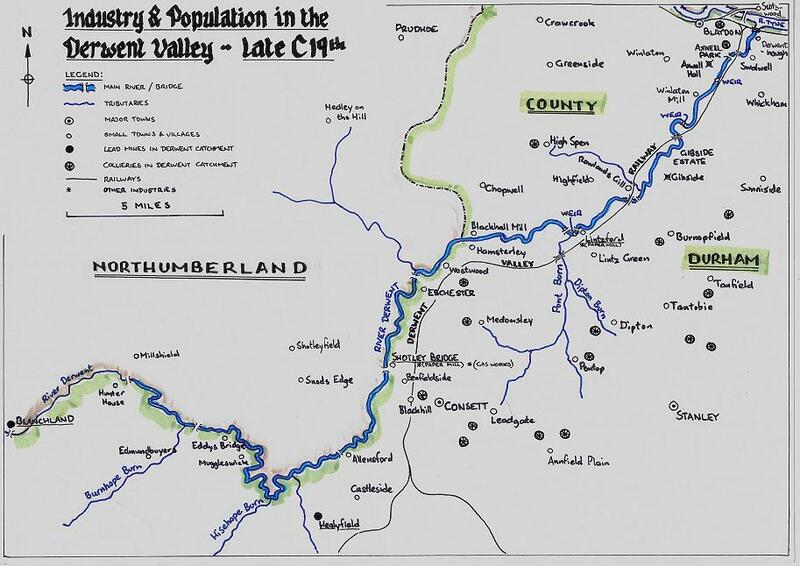 On the subject of pollution, members of the Committee reported having visited the lead mines at Blanchland and Healyfield, both of which were a cause of great damage to the river in its upper reaches. Changes in working practices were discussed and assurances given concerning the introduction of settlement ponds in the course of the streams carrying lead washings from the hush to the main river – an effective technique still used to this day to neutralise toxic elements in groundwater. Mr Stobbs’ letter was alluded to in full at the next AGM in March 1868 and while the secretaries reported a very commendable 51 season tickets sold in 1867, news of progress on the pollution front was more sobering, with reports that the Derwent Mining Company had “never got beyond promises and fair words” in regard to their undertakings on water filtration. By 1873, in response to this devastation of the trout stocks in many parts of the river, the issue of restocking the Derwent with trout or trout ova by the Association was first raised by a Mr J Pescod. The Chairman responded enthusiastically to the idea, saying, “To stock the river with plenty of fish would be very desirable”. It would however still be some years before the plan was actually put into practice. The late 1870s saw the first evidence of measures at last being taken to quell the amount of pollution entering the river. The report from the 1878 AGM stated that “Messrs. Annandale were spending over a thousand pounds in the erection of filtering ponds at their Shotley Bridge Mill and hope was expressed that the owners of lead mines further up the river would follow their good example.” By this time, it was generally accepted that there were far fewer trout present in the lower river, below Shotley Bridge, but the association was given a much needed shot in the arm that year by a further deputation of bank space from Colonel Joicey that allowed members the right to fish the upper reaches from Blanchland down to Edmundbyers Bridge. Mercifully, the AGM of 1879 reported no new incidences of pollution in the Derwent Valley, but poaching – an issue that had simply been overshadowed by pollution, rather than gone away – now reared its ugly head in a different guise. The association, by now called simply the Derwent Angling Association, with its accounts showing healthy annual balances after rent and expenses, had several years earlier reduced the charge for season tickets. Unfortunately, it seemed, certain unscrupulous individuals were taking advantage of such generosity, particularly on that section recently deputed by Colonel Joicey, where the keeper reported a number of men visiting the river on the pretext of fishing, but with the real intention of destroying game. Five men, only one of whom was eventually found to be a member, were ultimately convicted of poaching at Hexham Magistrates and it was therefore decided to pay a gratuity of £1 to each of five river keepers to keep that part of the river “well preserved”. In 1880, it was reported that the association “had had occasion to proceed against four men for illegal fishing and a conviction had been obtained, which, it was hoped, would be a warning against other parties that might be disposed to poach”. The cost of fishing tickets was further reduced to 2s, 6d, “so that there could be no excuse for any person fishing in the waters of the association without being provided with one”. 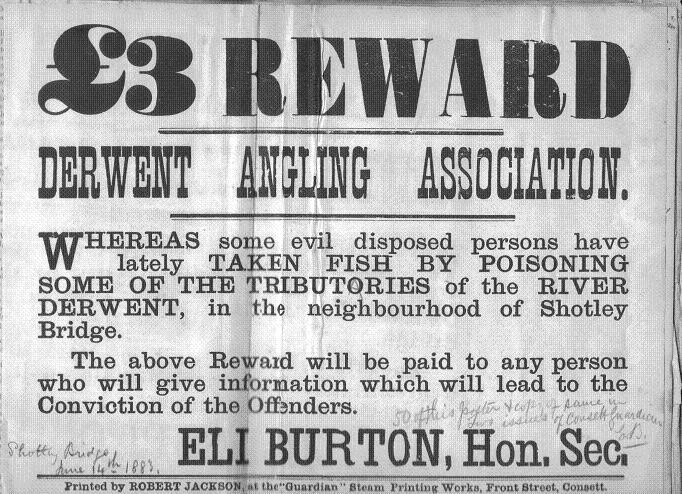 The practice of paying gratuities to river watchers continued, owing to their obvious success in catching poachers and, as the new decade progressed, other novel ideas were introduced, such as the forwarding and seconding of new members by existing ones, to counter allegations that some anglers were acquiring tickets under false pretences. It was also stated at the 1880 AGM that the number of members had increased considerably, helping the association declare a healthy balance of £53, 4s, 4d, with the society now careful to admit only those who were honest anglers. The Chairman was also able to report that “the Derwent was pretty well stocked with trout, and that a tolerable day’s sport might be had by followers of the gentle craft”. The river Derwent of the early 1880s continued to be a river of two halves – the upper section, above Shotley Bridge, reckoned by many to have much improved in the decade and a half the association had been in residence, while the water quality in the Pont Burn (and hence the Derwent below Lintzford) was as bad as ever. Yet suggestions that the organisation should litigate against the polluters under the new Rivers Pollution Act continued to be dismissed, with the Chairman stating quite categorically that the healthy balance held by the association “would soon disappear” if they were to do so. By 1883, the emphasis had in any case switched to the restocking idea first investigated ten years earlier, with the introduction of grayling and the North American brook trout advocated. In what might today appear bizarre logic, it was initially suggested that the brook trout be stocked into the lower section of the river and the grayling introduced further up, although given the apparent state of the Derwent below Lintzford, any stock released there would almost certainly have perished. In the end, the decision regarding grayling was deferred until the end of the 1883 season, as the association went about sourcing the appropriate stock. By the time of that meeting in late 1883, however, there were still no hard and fast plans in place and there even seemed to be some confusion over what, exactly, the association intended to stock. The Chairman had been in correspondence with a Thomas Ford of Manor Fisheries in Caistor, Lincolnshire, who had clearly sought to impress upon him the superiority of the North American brook trout, Salmo fontinalis (actually a member of the char family), “over all other species of grayling”! The Chairman produced two specimens sent to him by the fisheries manger, relating the express opinion of Mr Ford that fontinalis was “in every way adapted to the climate and temperature of the river Derwent”. With hindsight, it is now clear that such claims were somewhat fantastical, but nonetheless the association made ready to purchase a quantity of brook trout ova, despite the fact that the species in question was neither a grayling nor a real trout! In a communication dated 9 November 1883, Manor Fisheries acknowledged an order from the association for 2,500 fontinalis eggs at a cost of £6, which would be sent by train from Retford. The shipment was to be sent in February (they could only efficiently be transported in winter) with instructions that they be placed in the tributaries close to the source of the river, where they “should remain out of reach of the bigger fish”. ‘We are strongly of the opinion that it is a great mistake to put the Fontinalis into our English trout streams. It is not suitable to our rivers. It will not breed in them. It is not such a good fish as our English trout. Other wise counsel included the suggestion that Mr Ford’s Brook Trout fought in a way “which an English trout half their size would be ashamed of” – information which the association must have taken note of! The following year’s report of an AGM held in February 1884 recorded that while 6,000 fry had indeed been placed into the river at a cost of £16, 12s, 4,000 of these were fario (the species name then given to brown trout, probably sourced from Westgate House) and 2,000 were levensis, another species of British trout native to Loch Leven in Scotland, which is now known simply to be a variant strain of brown trout. As early as the summer of 1884, there were reports of the ‘Loch Leven trout’ showing up in catches from association waters (“near the Hedley Burn mouth”) suggesting beneficial results from this first round of fish stocking into the river. Yet, despite Mr Pallister’s words, the River Derwent was shortly to acquire its first viable alternative to the brown trout. The following February, as the 1886 AGM reverberated to reports of the capture of “probably the largest trout ever caught in the Derwent” – a 26¾ inch, 6½lb specimen taken by a Mr Bell near Westwood – the meeting resolved unanimously to procure a stock of grayling to be introduced to the river. It is to committee member Mr D Ormerod that several generations of Derwent anglers must be thankful for the continued presence of this graceful lady in our stream. It was Mr Ormerod who tabled the motion for the decisive vote and he who procured a specimen from a Mr Walbran of Poole in Yorkshire, to show at the meeting, caught by the latter from the river Ure. The meeting backed the idea and the committee was empowered to invest £5 on a stock of fish that were again to be procured from Westgate House. In a change from the previous year’s trout stocking, Mr Thomas Andrews, proprietor of Westgate House, recommended that the association this time obtain 100 yearlings, measuring between five and six inches, as opposed to 5,000 fry at the same cost, as “fish of this size will be practically safe from the attacks of the present denizens of the water”. After further discussion, to safeguard the future of the Derwent’s latest inhabitants, the committee issued the grim warning that “Any member found with a grayling in his possession between March 1886 and the end of September 1888 will forfeit his ticket.” Plans were made to introduce the stock fish “when the snow has about disappeared”. The Consett Guardian wasted no time in furnishing local anglers with information about the grayling, some of which was obviously in keeping with the general misconceptions of the time. Archive documents don’t reveal the actual details of that first introduction of grayling into the Derwent, but anecdotal evidence suggests that it happened some time in the early spring of 1886. The fish would have been brought north by train to Newcastle and then to a station at Blackhill on the branch line that ran up the valley from Derwenthaugh. The fish were transported in milk churns and near catastrophe was thankfully averted when a young lad employed to ride shotgun with the cargo discovered that the grayling had become distressed during the latter part of their journey. Realising that the problem was a lack of oxygenation, the boy showed wisdom beyond his years in alleviating the problem, using a vessel he found in the carriage to pour water from churn to churn. This introduced just enough oxygen to keep the fish alive for the last mile of their trip from the railway down to the river at Shotley Bridge. The grayling were successfully introduced and, as anyone who fishes the river today can testify, their progeny still thrive in great numbers in the river to this day. The first chapter in the story of the Derwent Angling Association was complete, as the association had at last fulfilled their aim of providing a game fishing river with two species for which their members to angle.